I’ve tried many methods of time tracking over the years – pen/paper, excel spreadsheets, the timer app in Quickbooks. All have their ups &amp; downs and they only work when you remember to use them. One of the tools I came across last year and fell in love with was an application called Toggl. Here’s a breakdown of why I love it and why it works for me. 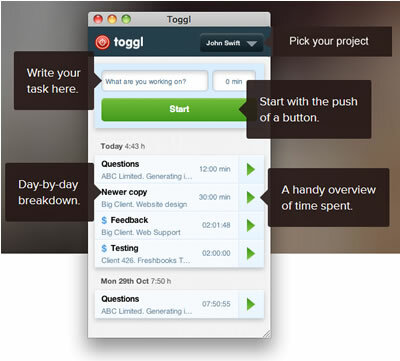 Toggl is available as a web-based solution, a desktop app or a mobile app. So I have the desktop app running on my work laptop as well as my iPod touch. I use the web-based solution to run/print reports. Regardless of which platform you’re using, the time entries auto sync with each other as long as you’re connected to the internet. Using any of the platforms, you can use the app online or offline. It will sync your times as soon as you reconnect to the internet. For most of my projects I use the desktop app that way I don’t have to worry about opening my browser and getting sucked into social media wormholes. This is great for working on design projects and writing. Helps keep me focused. When I’m not at my computer or if I’m out meeting with a client, it’s easy to pop open the app on my iPod and start recording our meeting time. No more forgetting to add it to my timesheet because it’s not with me! This app is seriously easy to use. 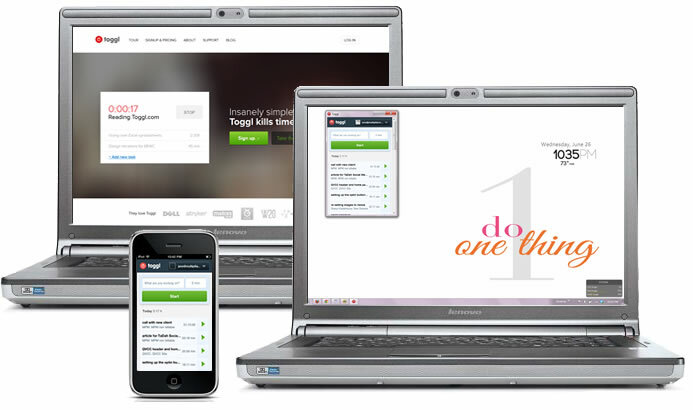 All platforms operate the exact same way so adding clients and projects as well as inputting your times are super easy. Once you add a client or project, it’s there for you to reuse again when needed. Just select it from the list add a quick description of what you’re working on and hit the start button. When you’re done or ready to switch to another project, just hit the stop button and select a new project. Since you can only work on one project at a time, it forces you to stay focused on the task until you’re ready to move on to the next one. Running reports are now fun for me. I get a total of all hours logged and a breakdown for each project. To help me manage my non-billable hours, I’ve set my business up as a client/project that way I can track my time. This includes things such as bookkeeping, email, social media time, blog posts, etc. When I run my weekly reports, I can then just subtract my project time against the total hours so I can get an accurate count of how productive I’ve been that week. Best part of all, the basic account is free! The paid version adds functionality to set billing rates per customer/project so you’ll know how profitable you are, create a hierarchy of tasks, allow larger teams to access the same data, integration with many other apps such as Basecamp and Freshbooks, plus a couple of other features. I’ve been using Toggl for over a year now and I haven’t needed to graduate to the paid version. However, should you need to upgrade to the paid version, it’s only going to set you back $5 a month per user. Even if you had a couple of people on your team or you needed the additional functionality, it’s still a super reasonable investment. So final notes: Like any time tracking app, it only works when you use it, but Toggl makes it fun and easy to keep track of those multiple projects you’re bouncing around doing every day as an entrepreneur. Like I’d mentioned, those 5-10 min. jobs do add up over the course of the week/month. Make sure you’re billing your clients appropriately! So what’s the time tracking method that works for you? Are you old-school with the pen and paper or do you go high-tech and rely on apps to keep you on task? Also if you’ve used Toggl before, what do you like/not like about it? Share with us in the comment box below, I’d love to know.